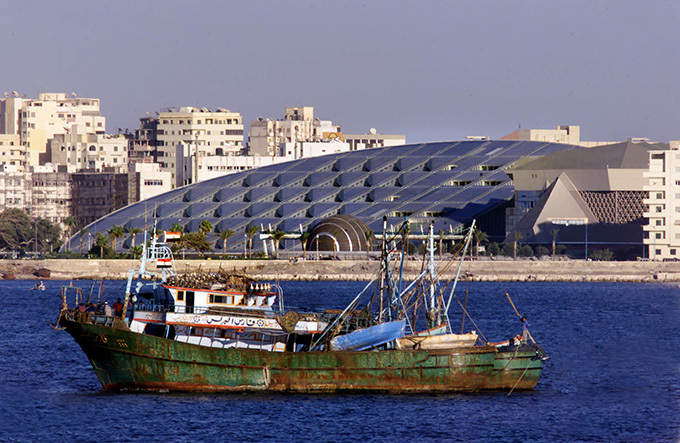 The Bibliotheca Alexandrina is officially dedicated in the Egyptian port city of Alexandria. It is a conscious attempt, even down to its Latin name, to recreate the Royal Library of Alexandria, the largest library in the ancient world. The Bibliotheca Alexandrina is also the mirror site of the Internet Archive, which is housed thousands of miles away in San Francisco. In that capacity, the library’s role is to ensure the stability of the archive. It also affirms one of the library’s stated goals to be a player in the digital age. Scholars at Alexandria University conceived the project in 1974, and it was quickly embraced by everyone from the Egyptian government to UNESCO. A Norwegian architectural firm won the commission to design the complex, with most of the initial funding coming from the Arab world. In the end, the project cost $220 million to complete, and Alexander’s metropolis (yes, thatAlexander) could boast a handsome addition to its cityscape. The original Royal Library of Alexandria was the foremost repository of scholarship for nearly 600 years before being destroyed by fire in the third century. Its founder, Ptolemy I, envisaged a gathering place for the world’s great scientists, scholars and thinkers. Like the modern complex, the Library of Alexandria housed not only a library (containing an estimated 700,000 scrolls), but science laboratories and research facilities as well. For all its splendor, the new Bibliotheca Alexandrina remains an incomplete, and somewhat problematical, project. Much of the shelf space stands empty, because there aren’t nearly enough volumes available to fill it. At the current rate of acquisition and funding, it’s been estimated that it will take 80 years to fully stock the place. This has led to criticism that too much money was spent on the facility itself, without setting aside enough money to build the permanent collections. There is also the ever-present threat of censorship, because the Egyptian government is no particular friend of the free flow of information. The library’s current director, however, Ismail Serageldin, is a highly esteemed professor, sometimes referred to as “the most intelligent man in Egypt.” His background is in engineering, but he is a respected authority in many spheres, making him an international figure and a force for moderation.